The Virginia Fund Raising Institute (VFRI) is a cooperative effort of six of the Association of Fundraising Professionals (AFP) Virginia Chapters through the AFP Virginia Caucus. These chapters organize annually to coordinate VFRI and advance philanthropy through education and fellowship. The Virginia Fund Raising Institute, founded in 1992, hosts interactive educational workshops and several keynote presentations designed to inspire and equip development professionals, board members, and executive directors to excel in fundraising and nonprofit management. In addition, 15-20 exhibitors and sponsors bring their knowledge and counsel in nonprofit and volunteer management to VFRI and help you be successful. At VFRI, development and nonprofit executives can take advantage of professional networking, workshops, and roundtable discussions to gain valuable insights into the challenges facing the nonprofit world. 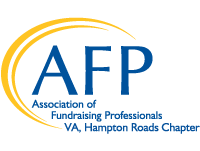 This application form is to be used by applicants requesting a scholarship from the Association of Fundraising Professionals Hampton Roads (AFP HR) Chapter. All Applicants must be members of the Hampton Roads Chapter of AFP. The VFRI scholarship is valued at $280 and includes access to all sessions, two Continental breakfasts, two lunches and a networking reception. It does not include hotel, additional meals and travel. This year our chapter is offering three scholarship types, a scholarship for general members, a young professional scholarship and a diversity scholarship. Applicants will be considered for all scholarships that apply. All applications must be received by May 3, 2019. Email the application to admin@afp-hr.org.